iSkin, the name that is synonymous in the accessory industry for creating products that fit many of the Apple products that we have come to know and love. From cases and covers for your MacBook to your iPod, they’ve got it ‘covered’ in the literal sense. I’ve been testing the iSkin ProTouch for the MacBook Pro, what is essentially a semi-transparent silicone material. Each key has been moulded to ensure that the silicone sits perfectly on top of each key without any slip or glide. There’s no adhesive, so no sticky messy substances need to come in contact with your Mac. Why do you want it? 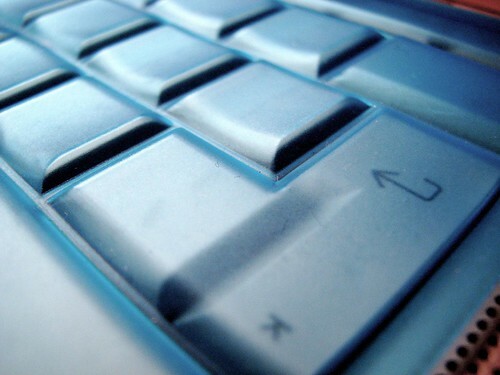 Well even if you’re not the type to be eating and drinking whilst your on your computer, having a keyboard protector will prevent dust from getting trapped in between keys and will prevent wear and tear on your keys. 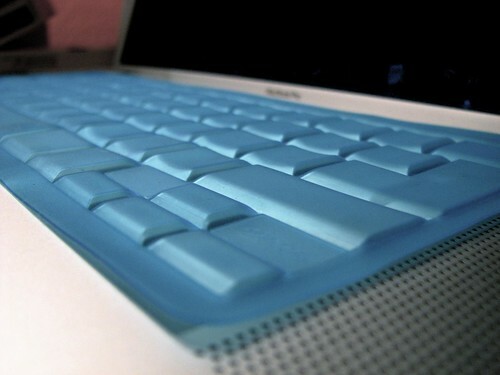 If you don’t use a keyboard protector, after several months of regular usage, your keyboard will start to change colour and will lose its ‘new’ look and freshness. You also start to find patches on your keys where your fingers have most commonly touched. There are other reasons for wanting a keyboard protector though. For such minimal cost in getting one you (and perhaps others) can benefit from quieter typing. The silicone layer is able to cushion each key stroke and absorb noise from the keys so what you end up with is a silenced keyboard. Keys are also softened to the touch. I’ve found that the ProTouch not only silences each keystroke it also gives my keys a softer press. 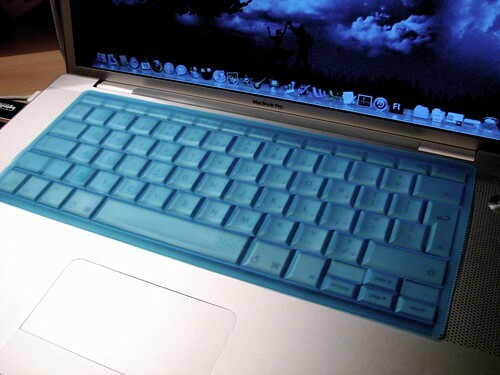 On top of all that, you can get some funky colours which allows you to customise your Mac. I’ve been provided with the Sonic frosted blue version, but there’s also the pink, clear and even glow in the dark versions. As you can see from the picture above, the ProTouch hasn’t been modelled to fit the MacBook Pro keyboard exactly to spec. The Enter key hasn’t been designed to fit perfectly. This is the second time I have seen this in a keyboard protect from a different manufacturer and I’m not quite sure why. Despite this minor oversight, the cosmetic appeal and functionality aren’t affected since you don’t really notice it unless you go looking for it. 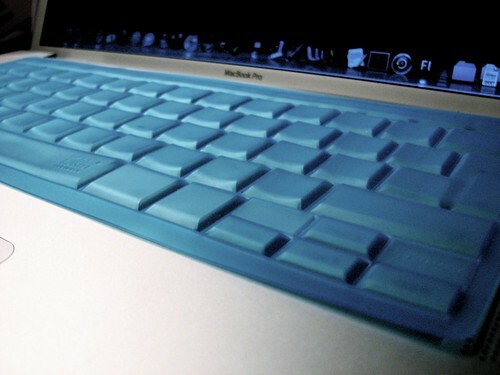 ProTouch has given my Mac a new refreshed look with its cool blue finish to my otherwise cold silver keyboard is fitting for the current seasons cool climate. Since the ProTouch is made of silicone it makes maintaining that clean look very easy. You can just lift it off your keyboard and place under a cold tap for a few seconds. Dry thoroughly before placing back on to your keyboard and you’re done. For this years festive season, avoid the hassle of getting the christmas crumbs out from under your keyboard keys. Many of us will be unwrapping shiny new MacBooks from under the tree so why not invest in the ProTouch so you can start the new year with a clear conscience and a clean keyboard. The iSkin ProTouch is available for the MacBook, MacBook Pro, PowerBook, iBook, Apple Keyboard and Final Cut Pro layout for Apple Keyboard. If you know, could you please tell me where I can purshase this EXACT protector because this is the same keyboard as mine and absolutely no one has a cover for it. @Tanya: I think they might have stopped making these as the iSkin website only lists the covers for their latest models. eBay may be your next best bet.